Comedy writer. In love with poetry and surrealism. Each time the first impulse of creation is inward, beginning with my own obsessions. I emphasize the fantastic, the poetic imagination and the surprising appearances. Topics: the issue of LGBT in confronting the restrictions of the Orthodox Church; depression and temptation of suicide; loneliness, the search for the sacred, or the convulsions of couple relations within fractured life in large cities; the fabulous world of the Romanian avant-garde from the beginning of the 20th century; the dystopic future of the country I live in. The comic is the basic underground line of my texts, and in the last prize-winning productions, those who have appreciated it have always remarked this. 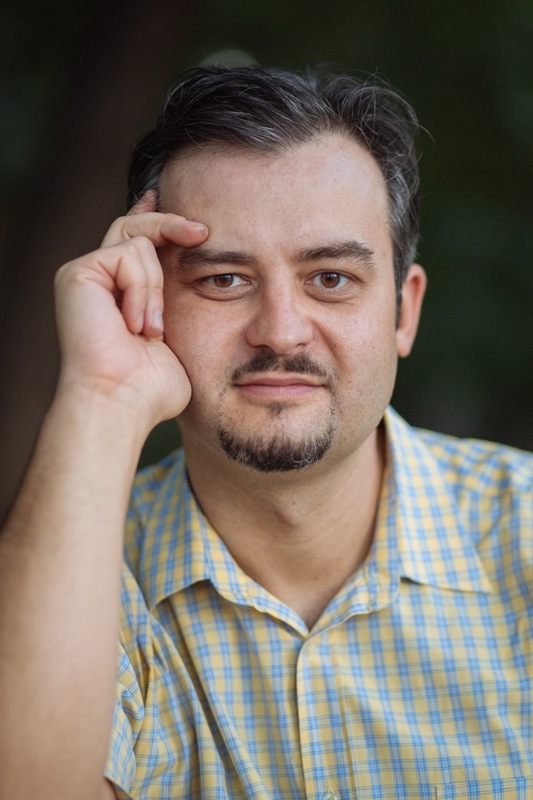 Radu Popescu was born in 1976 in Galati. Monodrama presents the life of a 65-year-old taxi driver still in power who tells his life to the public as he cooks pancakes that he will eventually share with them. And as he waits for someone to knock at the door anytime now – someone mysteriously ominous.He will cook some pancakes made only with healthy and bio ingredients starting with water that “must not have memory”. So our hero uses only distilled water to cook. Or gluten-free pancakes (without flour) – because if you have not already figured out, our taxi driver is passionate about eating healthy and without “E”.Passionate or obsessed. As he cooks the best and healthy pancakes, he tells his life’s story: how he and his wife grew heavily a boy who is now unhappy in marriage; how he had a stomach ulcer after long contacts with the corrupt state authorities, at the time he tried to make a small business. And how, eventually, his beloved wife got sick and died of pancreatic cancer two years ago.In slalom, among the information about the poisons we are fed to as a guinea-pig population (a bit of the theory of conspiracies among the rows), we feel the presence of an acute loneliness. Our elder (because he seems aging under our eyes, filled with the fears he brings out of yellowish post-it) confesses that it has just killed his boy by throwing it out of their twelve-story block! As a salvation from his unhappy life. The confession comes right up to the climax in which it is ready to serve the audience with fresh pancakes.But it was just a trick! They never had children. His wife made an abortion and could never have children since. Otherwise, all the details are true. And yes, he threw someone out of the block. A few hours ago. Their old dog, who also seems to suffer from a painful cancer. So he gave him this last gift – the death. And for now the absolute loneliness of our taxi driver can not be broken with anything. Maybe just by sharing some hot pancakes with the audience. Alexandra, a young attorney at the beginning of her career, meets Nicole, a lonely IT programmer, when the latter wants, for reasons of obscurity, to make her will. Assuming that Nicole wants to commit suicide, Alexandra starts a friendship relation with Nicole.The friendship of the two turns into an intimate relationship in accidental circumstances. Both women must first cross their own prejudices: Alexandra is a practicing Orthodox Christian, while Nicole has no natural inclinations towards women.The relationship that is developing brings both good and unpleasant things: Nicole reckons with God and the absurd death of his boyfriend three years ago thorough Alexandra’s beliefs. Alexandra hardly recognizes her homosexuality and tries to reconcile this with his faith and with the prohibition of the Church. Lifestyle mismatches and minor fights appear between the two lovers.Finally, faced with the difficult character of Nicole, Alexandra runs away, retreating into the canons imposed by her religion. Hesitantly, she promises Nicole that she will soon return to her, but in fact she just takes time out. Nicole tries to punish her, threatening her again with the will and possible suicide (another fact condemned by the Church). Alexandra’s delays aggravate the situation, and when she decides to return to Nicole – it’s too late.Faced with loneliness and acute depression Nicole is committing suicide.In spite of Nicole’s testamentary provisions, Alexandra decides to make it a funeral after the orthodox pattern (so lying to the church on the real cause of Nicole’s death).The end shows us an Alexandra in a few years: in one way or another she manages to reconcile faith with her instincts. She enters into a new relationship with a woman.